All you need to know to determine the fertile days and ovulation with the symptothermal / Fertility Awareness method of getting pregnant naturally. The Symptothermal method is the most accurate method of determining the fertile days in the cycle. With it, it is possible to limit ovulation to a few days. I myself have become pregnant with this method in the first cycle. In the following, I would like to briefly explain what you need for the application of the Symptothermal method – to become pregnant naturally. Similarly, I will objectively evaluate the method with regard to fertility indication, practicality and cost as much as possible. How does the Symptothermal Method work? 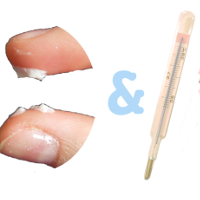 For the application of the Symptothermal Method, it is necessary to document your basal temperature in combination with the cervical mucus or the cervix. For the documentation, I recommend the use of a suitable Symptothermal Method app. If you don’t have a smartphone, or if you don’t have the app for other reasons, you can also add it to an analogue cycle sheet for printing. For the morning measurement of temperature, I recommend a suitable thermometer with two decimal places or an analogue thermometer. Once you have entered your cervical mucus and basal temperature into your app or cycle sheet, you will get a cycle curve that you can evaluate according to certain rules or automatically evaluate it using the app. The rules can be read in the WHEN AM I Fertile! White paper. To determine the fertile days, the Symptothermal Method is the best method currently available. In a comparative study by the Stiftung Warentest, the Symptothermal Method has easily replaced all current cycle computers. For the desire to have children but particularly the interesting features that the method brings. 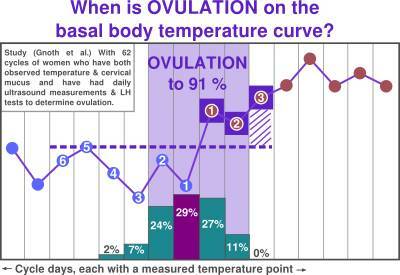 First, with the Symptothermal method, ovulation can be narrowed down to just a few days – this has been proven in studies with ultrasound examination. 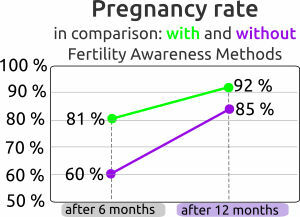 Secondly, with this method, one can determine a pregnancy only on the basis of the temperature curve – i.e. without a pregnancy test. Thirdly, with the documenting of cycle records, you are able to diagnose cycle peculiarities that may still hinder the desire for childbearing, such as PCOS or corpus luteum weakness, and then treat them in a targeted way. These three advantages make the Symptothermal method, in my view, the best way to determine the fertile days that exist. The Symptothermal method can be used in any stage of life, even after the pill or other hormonal methods, lactation and menopause. The daily effort for documentation of ovulation signs, basal temperature and mucus is about 3 to 5 minutes and is comparable with daily tooth brushing. I personally find the method very practical. However, one to three cycles must be planned for the learning cycle of the method. I recommend learning the method at least with a book or through a course. C Gnoth et. al. Hum Reprod. 2003 Sep;18(9):1959-66. I offer relevant online offerings for this. 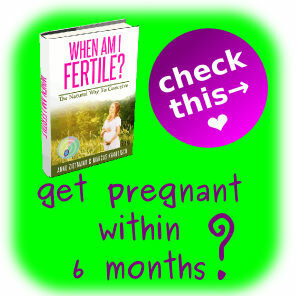 Once the ebook “When Am I fertile? is the perfect medium to start, you can concentrate on the essentials and I just have a lot of fertility tips for you that can help you specifically in getting pregnant. Most couples thus become pregnant within six months. Studies also show that 81% of couples use Symptothermal methods to become pregnant within six months. After one year, it is even 92%. Becoming pregnant with the Symptothermal Method is not a coincidence, but simply applied biology and fertility knowledge.